Denomination : Silver Antoninianus. Mint : Rome. Date : AD 243 to 244. Size : 22.4 x 23.3 mm. Weight : 4.46 grams. Grade : VF, well struck and very well centered, attractively toned on a good sized flan. The only thing not on the flan is the very outside edge of ring of beads along on edge of the obverse. 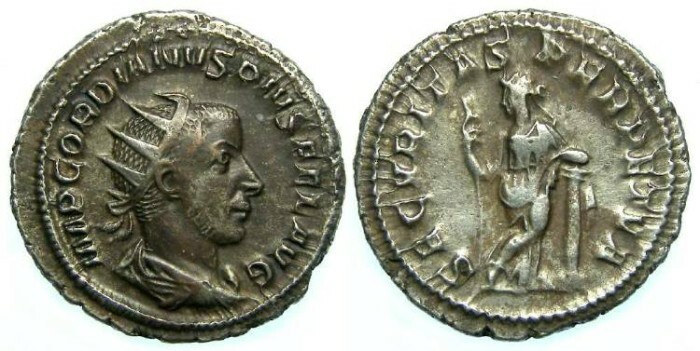 Obverse : Radiate head of Gordian right, with IMP GORDIANVS PIVS FEL AVG around. Reverse : Securitas slightly left, leaning back on a column and holding a sceptre, with SECVRITAS PERPETVA around.